The math homework sheet is pictured below. 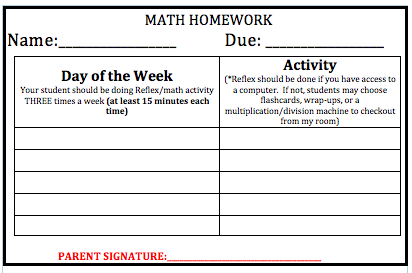 Each week, students need to complete a math activity at least three times. If you have access to a computer, I would like for them to be doing Reflex Math. Reflex math collects lots of useful data for me, such as which facts each student has mastered, which facts they are struggling with, graphing of fact fluency gains, etc. Each session of Reflex needs to be AT LEAST 15 MINUTES to count as a "good practice." They're goal should also be to make the "green light" come on. However, if you do not have access to a computer, your student may choose a different math activity such as multiplication flashcards or another math manipulative that they are welcome to check out from my classroom. Click here to go to Reflex Math! Link #4-- Submitted by Bella during a natural disasters project! Thanks Bella! Link #4--Submitted by Sarah Neale working towards her First Aid Badge for her Brownie troop! Link#5-Submitted by Sarah Neale working towards her First Aid Badge for her Brownie troop!